This set is ideal for equipping lab stations. It has six of the most popular spoons and spatulas for the laboratory. The set includes a micro-spoon with a plastic handle. 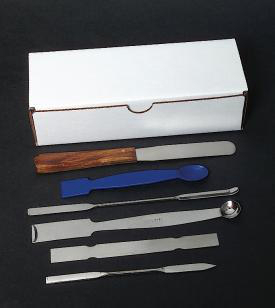 Ordering information: This set includes one of each of the following: a 4" blade mounted on hardwood handle; micro-spoon with plastic handle; 6" stainless steel utensil–one end flat, one end spoon; 6" stainless steel spatula–one end bent, one end flat; 6" stainless steel spatula–one end flat, one end tapered; and one 6" polypropylene utensil–one end spatula, one end spoon.